How litter-strewn are the roads in Sooke? 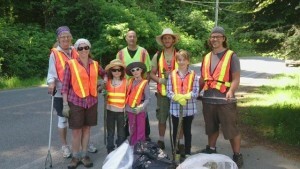 Somewhat but ultimately not bad at all as a team of Zero Waste Sooke volunteers discovered when they roamed local streets on Sunday, June 14 picking up stray bits of garbage and talking trash with residents along the way (as ZWS reps will also do at Canada Day on the Flats this Wednesday). bags of litter over four hours. Team leader Zach Ogilvie was able to recycle at least 80 percent of the haul at his curbside pick-up. The District of Sooke provided vests, garbage bags and insurance waivers, then collected and disposed of the residual 20 percent of bona fide trash. The ZWS roadside clean-up team plans to be a semi-regular part of local keep-it-tidy efforts. Employees of SPR Traffic Services snag roadside trash on visits to town every two weeks under contract with the District of Sooke. And an Adopt-A-Highway stretch of the Sooke Road is periodically scoured by the Sooke Youth Council in tandem with the Rotary Club of Sooke, most recently this last weekend. [sam id=”15″ codes=”true”]On June 14, residential areas of Sooke proved to be relatively spotless. “I’m bored, it’s hard to find anything to pick up,” said one of the team’s young volunteers. Unfortunately, the situation wasn’t quite as clean and green along Grant Road West, Helgesen, Church and Townsend Roads. Much of the trash was left by car and foot commuters, including cigarette butts and packages, paper coffee cups, fast-food wrappers, drink bottles, beer empties and plastic gum cases. Zero Waste Sooke is a new citizen’s initiative operating through Transition Town Sooke and inspired by Awareness Film Night’s screening of the Clean Bin Project documentary film early this year. More road-side clean-ups are planned later this summer and in the fall. 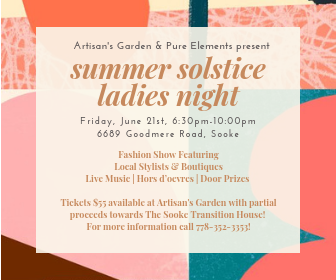 For more info, please search ‘Zero Waste Sooke’ on Facebook and Twitter. I’d like to bust the ignoramus that left two black plastic garbage bags of trash just off the road on the trail beside Muir Creek. Had I had gloves, I would have picked it up.